There’s no doubt about it, co-parenting is tough — especially if the relationship between you and your ex is strained. Fortunately we live in a digital age designed to make life more convenient and easier, so if you’re not already using a co-parenting app then it’s time to get one. Here are eight of the best for you to choose from. This simple app isn’t just great for co-parents but also other carers who are helping or involved in your children’s lives, such as grandparents, nannies, aunts and uncles. 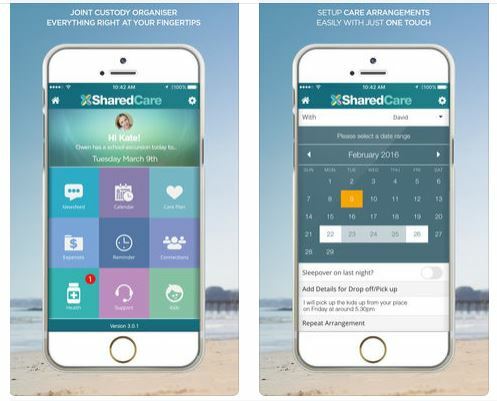 SharedCare keeps you in control of every aspect of your kids’ lives, from care arrangements, expenses (including reimbursement requests), sharing news and photos, or just keeping everyone on the same page – it’s got all the information you need right at your fingertips. Shared calendar – so everyone’s across the schedule and important dates. Care arrangements – request to swap days, schedule in holidays, check the care roster and more. Expense recorder – keep track of all child related expenses such as school fees, medical bills or even pocket money and store receipts for reference. Group news feed – great for making sure parents and family members don’t miss out on important milestones and events, without having to interact with the parent or carer in charge at the time. Designed to reduce stress and focus on a shared commitment to raising children in the best way possible, Parentship helps parents better manage emotional distress or ambiguity in order to schedule, communicate and keep track of their activity and custody calendar. Customised dashboard – shows upcoming events and alerts at a glance. Reminders – set reminders so you never forget important events again. Custom calendaring – coordinate your calendar without having to email, text or call. Smart profile – everything about your child in one digital location. Digital documents – eliminate the need to track important documents between homes. Designed for family connection, FamCal is really handy for all kinds of families – not just those who are co-parenting. A shared calendar, it allows you to share dates, schedules, tasks and notes all in the same place so everyone is in sync and organised. Family calendar – colour code events and people, share events, set up reminders and more. Lists and tasks – share grocery lists, work schedules, assign tasks and more. Family notes – share notes with anyone in the family with access to the app, jot down moments and more. 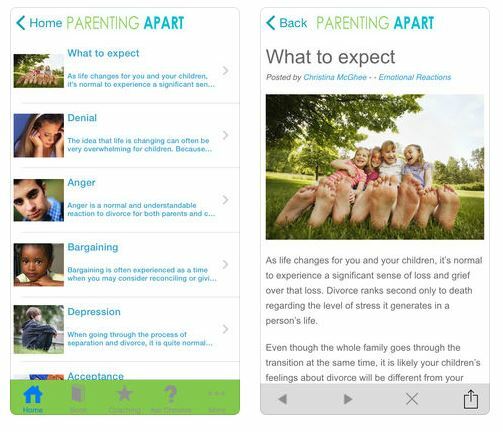 Created by divorce coach and parent educator, Christina McGhee, the Parenting Apart app is all about helping parents navigate the change to family life when separated, with minimal negative impact. It gives parents guidance, knowledge and quick answers to tough problems when co-parenting. With everything from emotional signs to look for in children, to legal options and how to discuss divorce with the kids, it’s a handy tool to help parents calmly manage the well-being of their children and themselves. No more confusion over who has the kids or difficult phone calls and texts to your ex. Custody Connection has a shared calendar where you can view the children’s schedule easily, share events, sync dates and rosters, request to swap days, store information such as medical details and more. 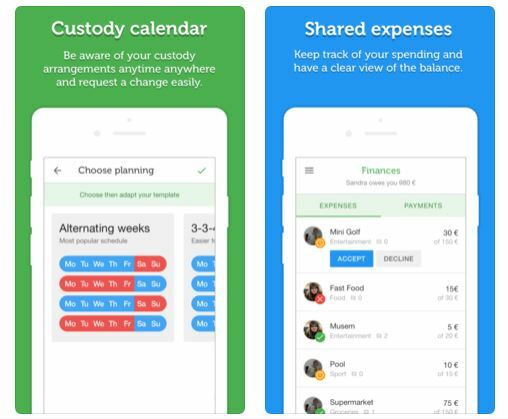 A great option for parents who are separated with children between two homes, 2Houses allows you to easily organise the custody schedule, manage the children’s expenses, upload photos and journal notes, exchange school details, medical information and more. Another great family calendar app that gets everyone on the same page with minimal fuss and stress. Cozi is ideal for co-parents, and super busy families or those with multiple carers. It allows you to set up a shared calendar, create to-do lists and even share recipes (great for when children may have specific allergies or dietary requirements). Okay so this last one isn’t actually an app, it’s an online co-parenting management system that you subscribe to. A nice option for those who prefer to work out schedules, track reports, and communicate with your co-parent via a computer. What apps or systems do you use to make co-parenting easier? Tell us on Facebook!